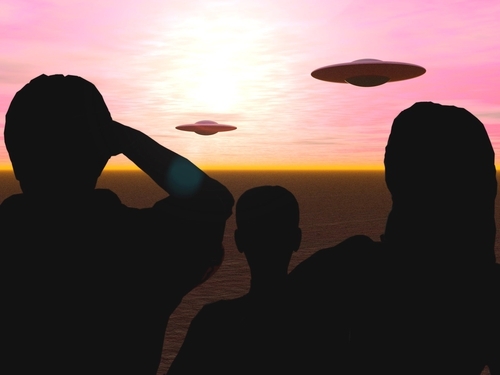 Britain's defence ministry has made public secret files on UFO sightings, including reports ranging from a woman claiming to be an alien to calm pilots giving objective accounts. The 19 different incidents were recorded between 1986 and 1992 and published by the National Archives on its website. Among the recorded incidents was a letter dated March 1990 from a woman who claimed she was an alien whose spaceship landed during World War II and was recovered by the British military. 'The crashed vehicle contained two males from Spectra, a planet orbiting the star Zeta Tucanae, and a female from one of the two inhabited planets in the Sirius system, Amazon the planet of warrior women,’ she wrote in the letter, which also included sketches of herself and of Spectrans. ‘That female was me,’ she wrote. On 21 April, 1991, the captain of an Alitalia airliner was on its way to London's Heathrow Airport from Milan when it had a close call with a UFO, the newly-revealed documents showed. Radar images at that time initially labelled the object, ‘cruise missile? ?’, but it was later confirmed that it was not a military weapon. But by 2 July, however, a defence ministry inquiry found the UFO had not come from any Army firing ranges, and added there had not been any ‘space-related activity’ that night.